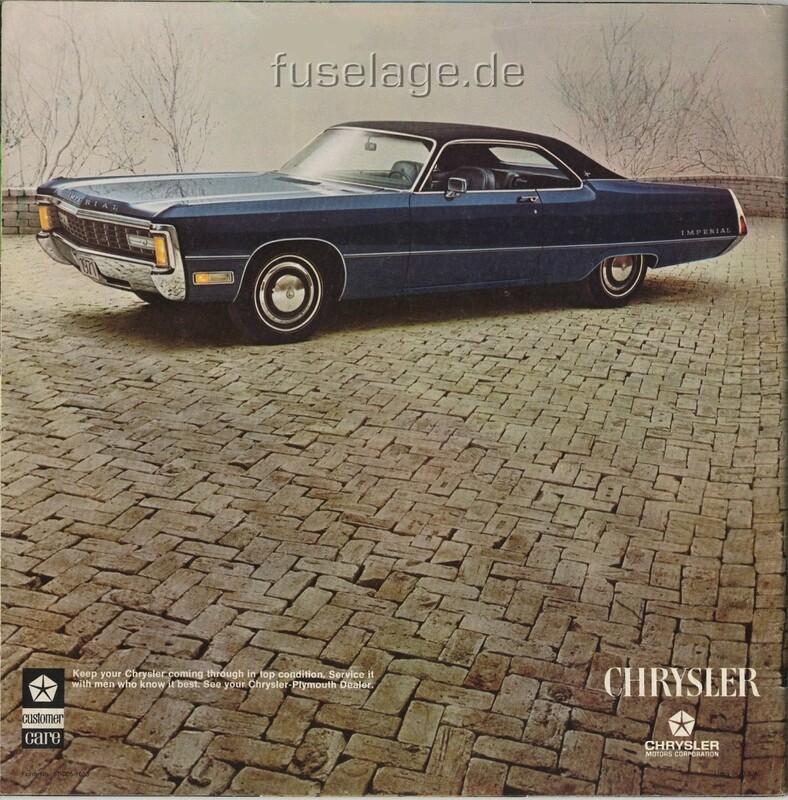 Actually the above picture shows the back of the 1971 Chrysler catalog. 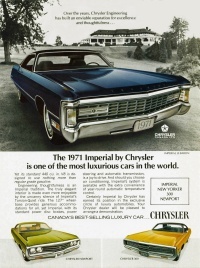 There was no separate Imperial catalog in this year since the Imperial models were now officially considered top-of-the-line Chryslers. 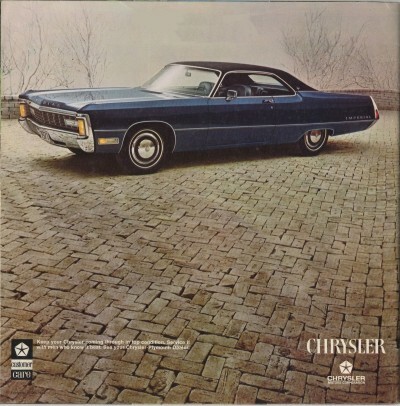 For additional information about 1971 Imperials, please check the 1971 Chrysler catalog. The Imperial Crowns were gone for good, so the lineup consisted only of the LeBaron models, available in four-door and two-door hardtop body style. Like on earlier LeBaron models, the vinyl roof came standard. "Chrysler calls the system FourWheel Sure Brake. It was developed in cooperation with Bendix, and it's pretty complicated on paper.There is a counting device at each wheel, monitoring the speed of each wheel, and reporting to a computer. Under hard braking, if one wheel begins to decelerate faster than the rest, a sign that the brake is about to lock and skid the tire, the counter tells the computer, and the computer instructs a pressure modulator to ease the braking pressure on that wheel. The wheel doesn't lock. This is done independently of the driver, who can have both feet on the brake pedal, pushing for all he's worth. The tires will not lock, the car will not skid or swerve. Ford and GM have two-wheel anti-lock systems. They say the complexity of the four-wheel system is more trouble than it's worth. Chrysler and Bendix say that the ability to steer the car on glare ice under maximum braking is worth the added equipment and money. 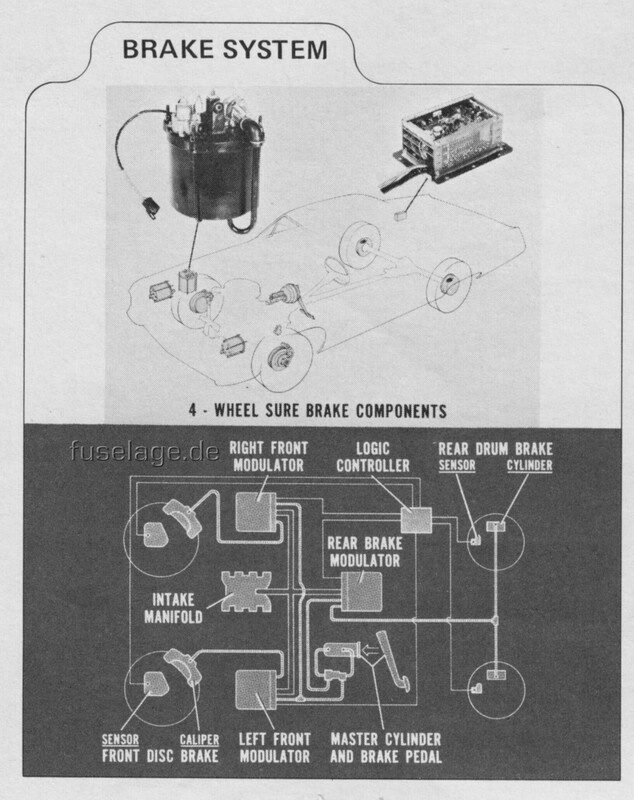 The Sure Brake works. On slippery pavement it will stop the car in less space than the best driver can. It's designed to fail-safe, that is, if it malfunctions, it turns itself off. The computer, counters and modulator are plug-in units. If they fail - and there's no reason for them not to last forever - they can be replaced in the field and repaired at the factory." Also new for 1971 were the square outside rearview mirrors, ventless side glass on 4-doors and a revised headlamp door styling. In the back, not much had changed: The big Imperial lettering had disappeared from the bumper, replaced by a small "IMPERIAL by Chrysler" on the trunklid. 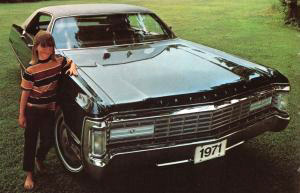 This year's models sported fender skirts again, like in 1969 (but not in 1970). Also new was the interior with slightly altered dashboard (now fully covered with pseudo wood appliqué), new door panels and a more contemporary seat styling. 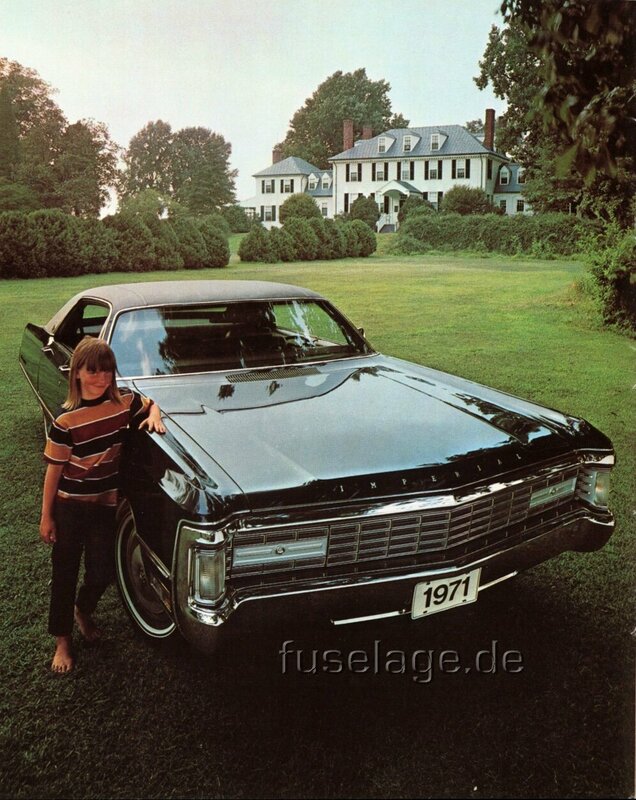 There were 10,116 four-door HT's and 1,442 two-door HT's produced in the 1971 model year. This Canadian magazine ad shows a 1971 Imperial two-door hardtop and promoted the marque as one of the most luxurious cars in the world. 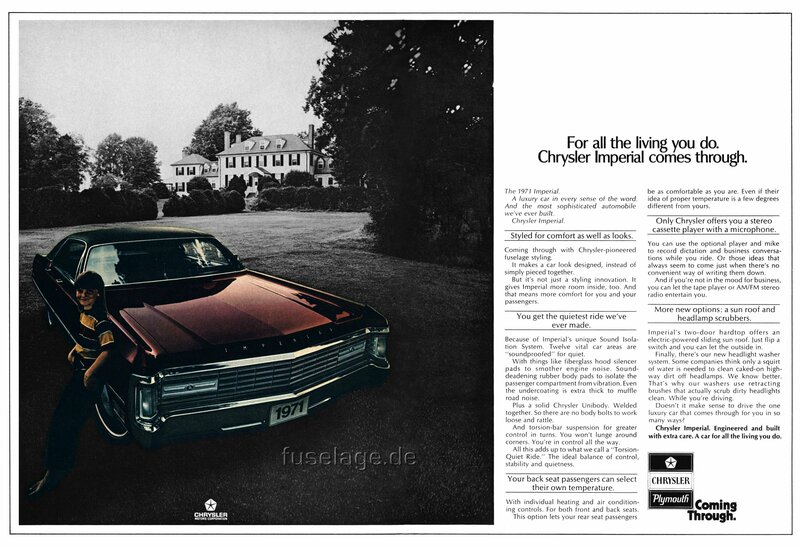 This is the only U.S. print ad for the 1971 Imperial. It shares the same layout and style as the 1971 Chrysler ads. 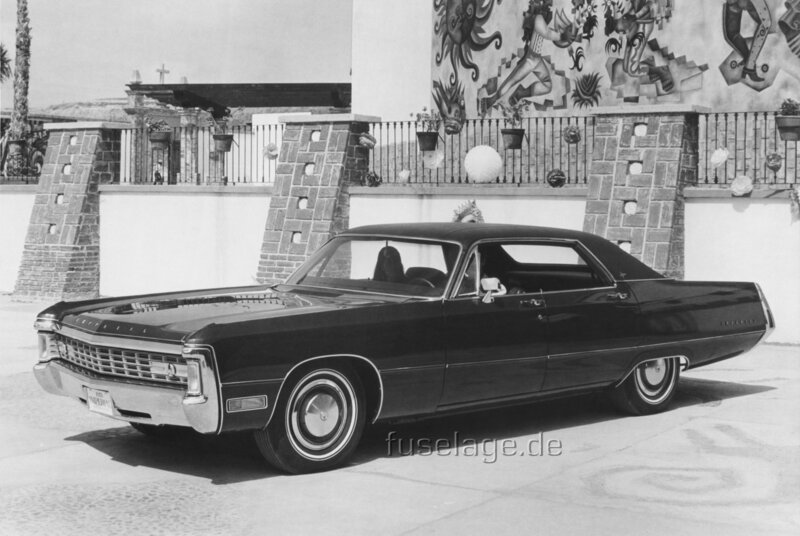 This early press photograph shows a pre-production model of the 1971 Imperial. The eagle emblems on the headlight doors are too big and are probably trunk lock covers. If you look closely, you'll notice how the picture was retouched to remove the chrome strip running along the hood and front fenders between the front bumper. This is the same car shown from behind. The fender skirts feature chrome moldings, like in 1969, but those were not seen on regular production models. This seems to be the same car but this image still shows the chrome strip mentioned above along the front lip of the hood. Those were not seen on regular production models. This image appears in the 1970 Corporation Annual Report. A similar motiv was also used for the print ad seen above. On this car, the headlight doors already look the same like those used for production. The chrome strip along the hood front edge (that didn't make it into regular production) is still there, though. 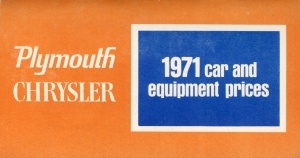 Click to see the list of manufacturer's suggested retail prices for the 1971 Imperial models and factory-installed options.